– For all regions, moving average measures (which smooth monthly volatility) remain above zero, indicating above trend activity. Recall that these figures measure relative average growth; each region has its own underlying growth rate. – The Portland area numbers remain below the peak pace of activity seen in late 2015, but the overall mix of positive contributions in the index reveals a healthy economy with generally broad-based gains. New housing permits made a positive contribution; although overall units permitted are increasingly similar to past expansions, home prices continue to rise in response to high demand. – Eugene-Springfield employment components were a bit weaker in February, but low unemployment continues to be boost the overall measure. – Central Oregon’s measure bounced back from two softer readings in prior months. A rebound in waste collection likely reflects a temporary offset for weather-related weakness earlier this year. – Low unemployment rates strongly supported both the Rogue Valley and Salem numbers. In both areas the number of new housing permits remains soft. 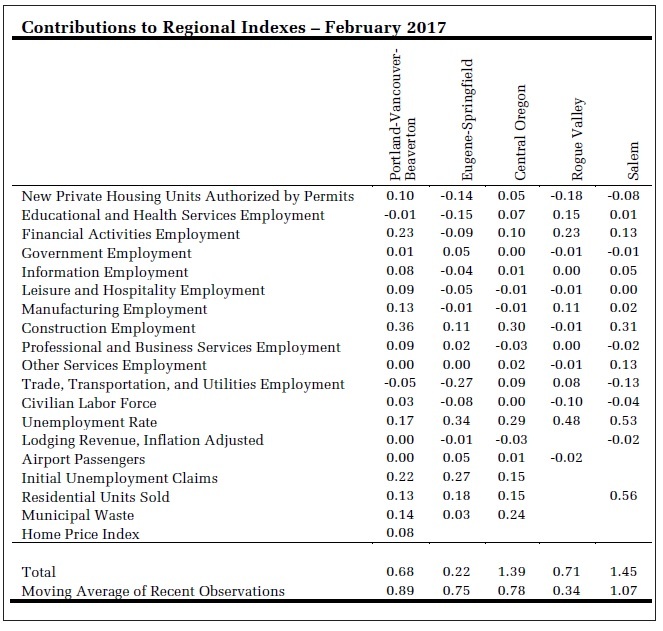 This is the University of Oregon Regional Economic Indexes for February 2017. The release date is today, April 24, 2017. We thank KeyBank for their generous support of this project.